Provided photo Several local organizations recently received grants from the Piqua Community Foundation. Pictured, left to right are: (seated) Patsy Cavender of Lockington United Methodist Church’s God’s Grocery, Deb Oexmann of Brukner Nature Center, Ruth Koon of the Garden Tribe Gardens and Friends of the Piqua Parks, Rebecca Sousek of Piqua Compassion Network; (standing) Keith Schaurer of Eagles’ Wings Stable, Becky Elifritz of U.V.M.C. Foundation, Amy Bixler of Goodwill/Easter Seals Sunrise Center, Bill Lutz of New Path, Inc., Beka Lindeman of Diagon Valley, Debbie Frazier of Greene Street Day Care and Preschool, Carla Bertke of the Rehab Center, Leesa Baker of the YWCA Piqua and Heather Sever of the Miami County YMCA. PIQUA — The Piqua Community Foundation presented $42,000 in organizational grants on Sept. 12, from its G. William Hartzell Charitable Fund. The distribution event, held at the YWCA Piqua, honored 14 local organizations with unrestricted funding. Recipients were introduced by Randi Pearson, a member of both the fund’s donor advisory committee and The Foundation Board of Directors. Grant checks were presented by Barbara (Mrs. G. William) Hartzell. Those receiving grants included Brukner Nature Center, Diagon Valley, Eagles’ Wings Stable, Friends of the Piqua Parks, the Garden Tribe Schoolyard Garden, Goodwill/Easter Seals of the Miami Valley, Greene Street Day Care and Preschool, Lockington United Methodist Church, the Miami County YMCA, The New Path, Inc., Piqua Compassion Network, the Rehabilitation Center for Neurological Development, the U.V.M.C. Foundation and the YWCA Piqua. More information about the grants and The Piqua Community Foundation can be found at piquacommunityfoundation.org. 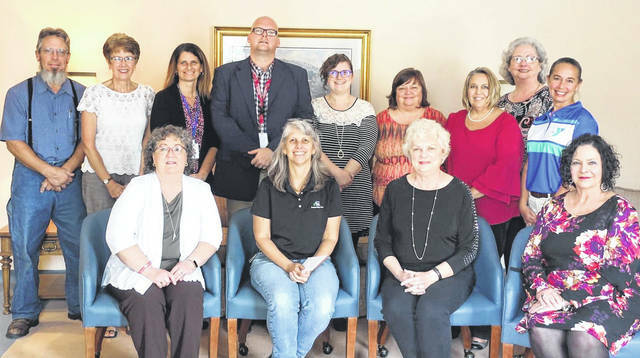 https://www.dailycall.com/wp-content/uploads/sites/30/2018/09/web1_Grant-Presentation-2018.jpgProvided photo Several local organizations recently received grants from the Piqua Community Foundation. Pictured, left to right are: (seated) Patsy Cavender of Lockington United Methodist Church’s God’s Grocery, Deb Oexmann of Brukner Nature Center, Ruth Koon of the Garden Tribe Gardens and Friends of the Piqua Parks, Rebecca Sousek of Piqua Compassion Network; (standing) Keith Schaurer of Eagles’ Wings Stable, Becky Elifritz of U.V.M.C. Foundation, Amy Bixler of Goodwill/Easter Seals Sunrise Center, Bill Lutz of New Path, Inc., Beka Lindeman of Diagon Valley, Debbie Frazier of Greene Street Day Care and Preschool, Carla Bertke of the Rehab Center, Leesa Baker of the YWCA Piqua and Heather Sever of the Miami County YMCA.